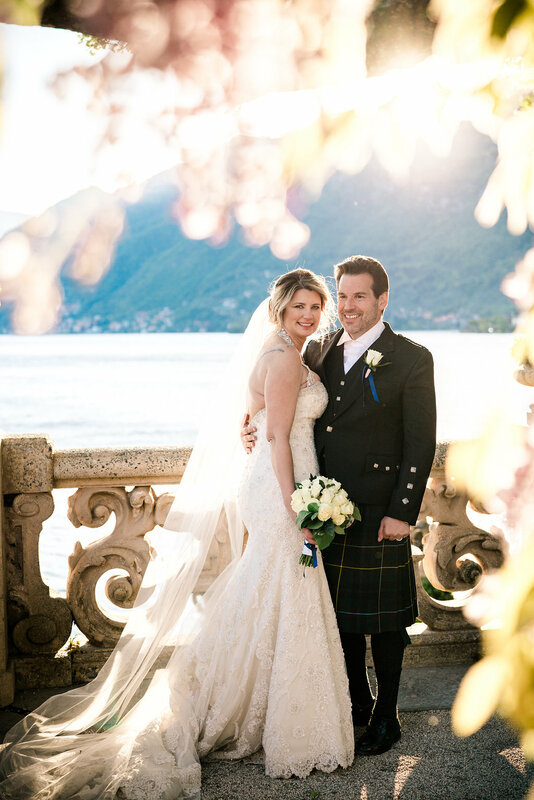 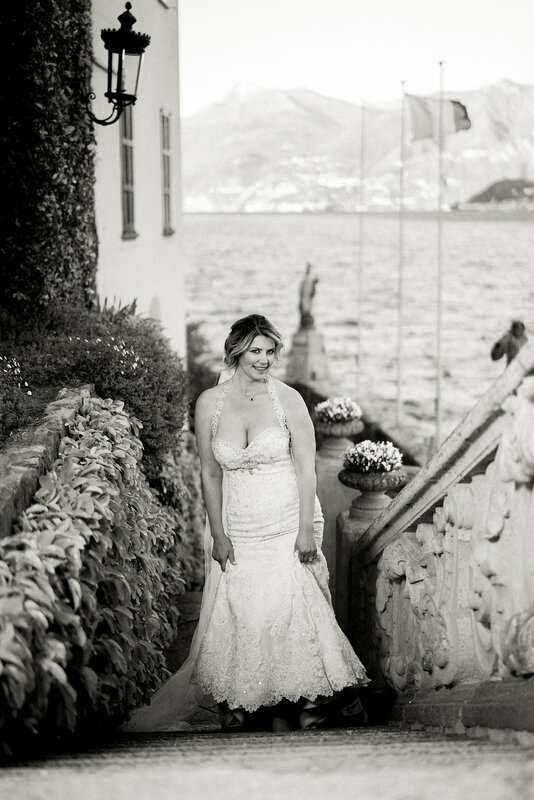 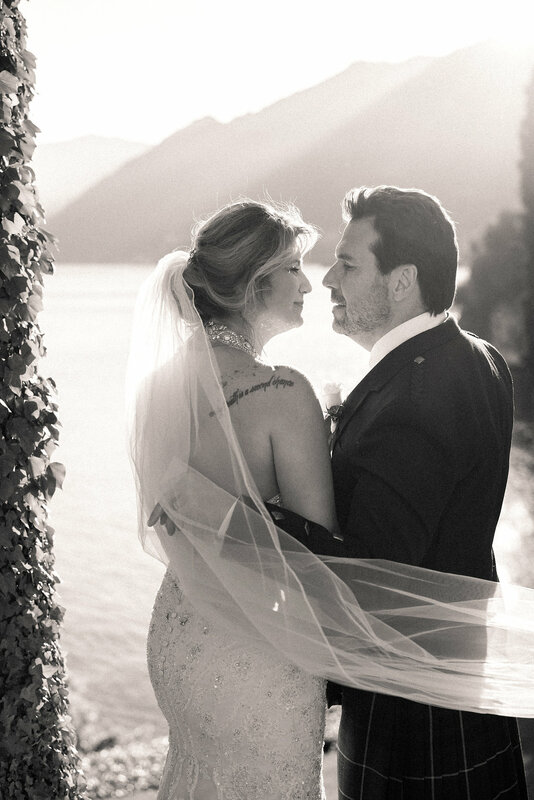 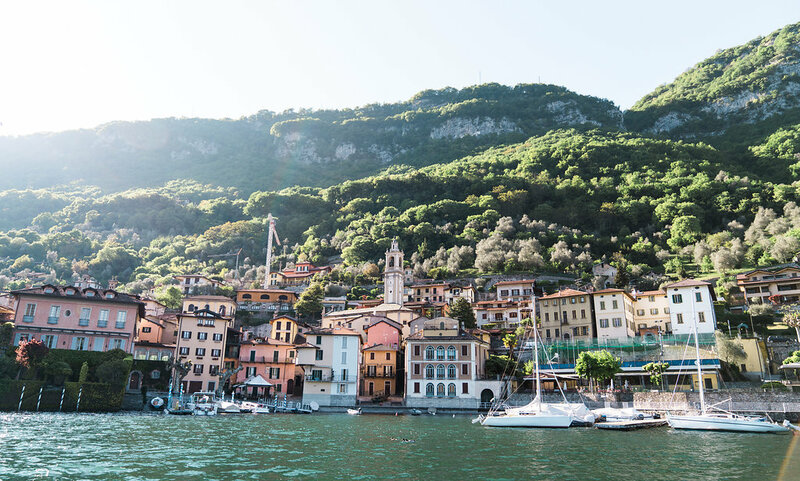 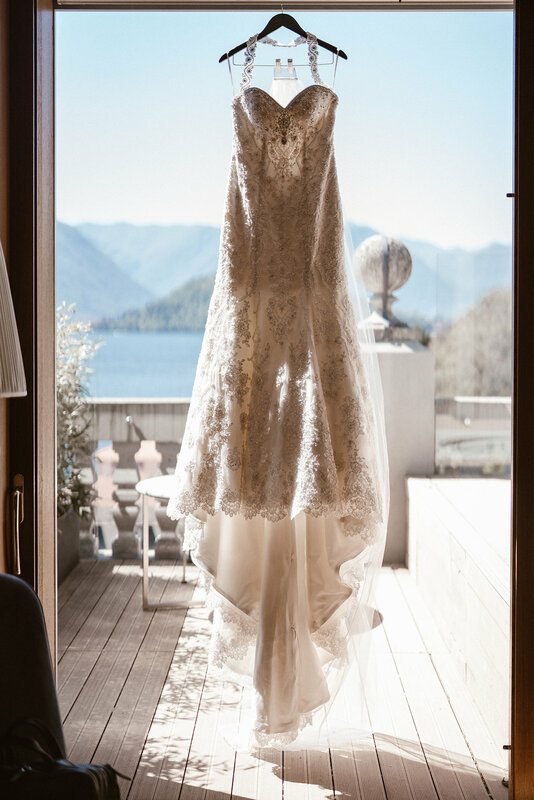 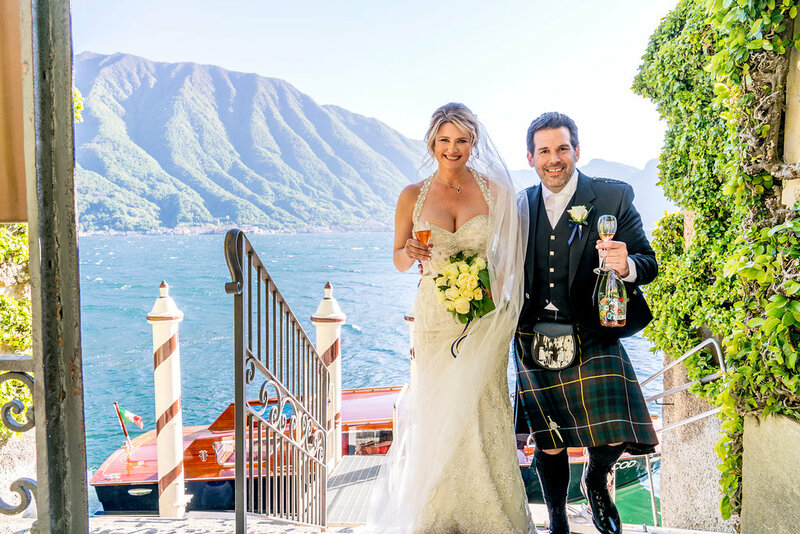 Tammy and Steve’s intimate destination elopement and marry-moon enjoyed by the romantic shores of Lake Como was planned from the US. 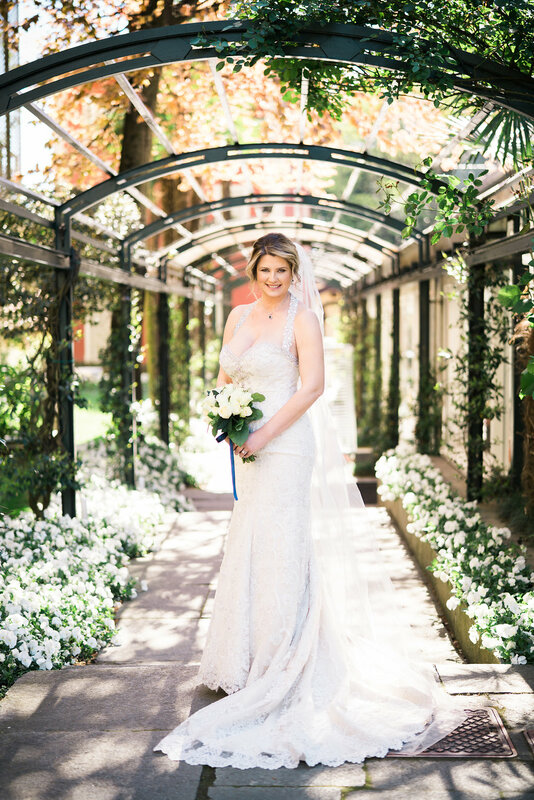 Tammy patiently sourced reputable wedding vendors via independent reviews and opted for an April wedding to avoid the intense heat and high tourist season. 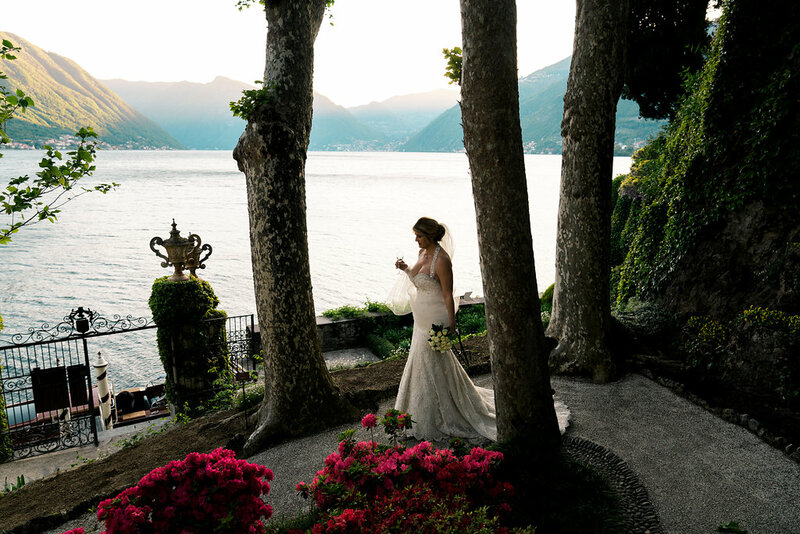 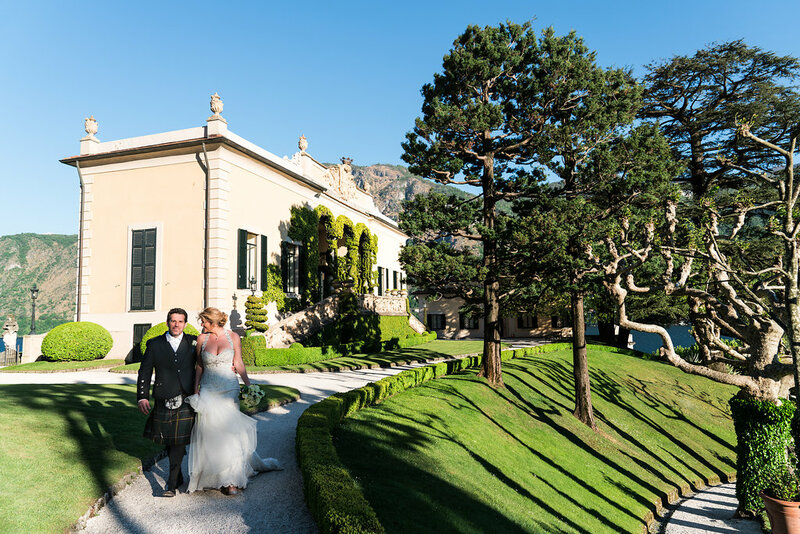 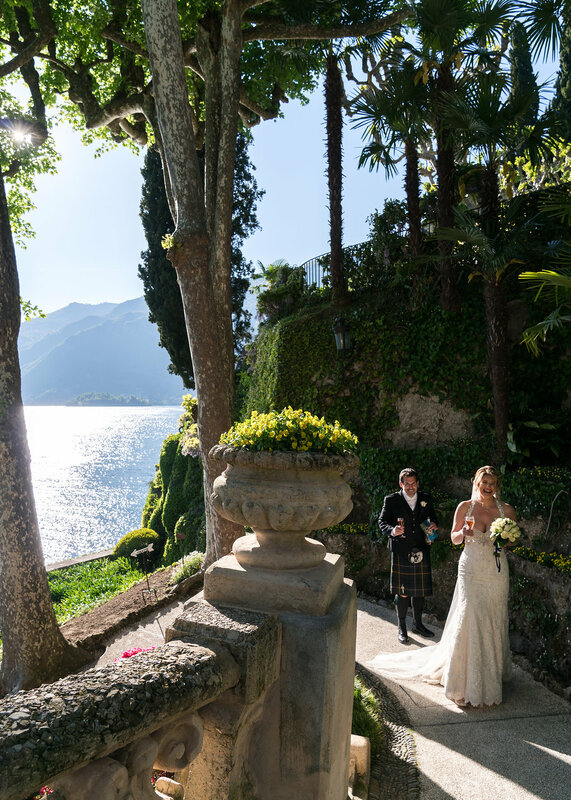 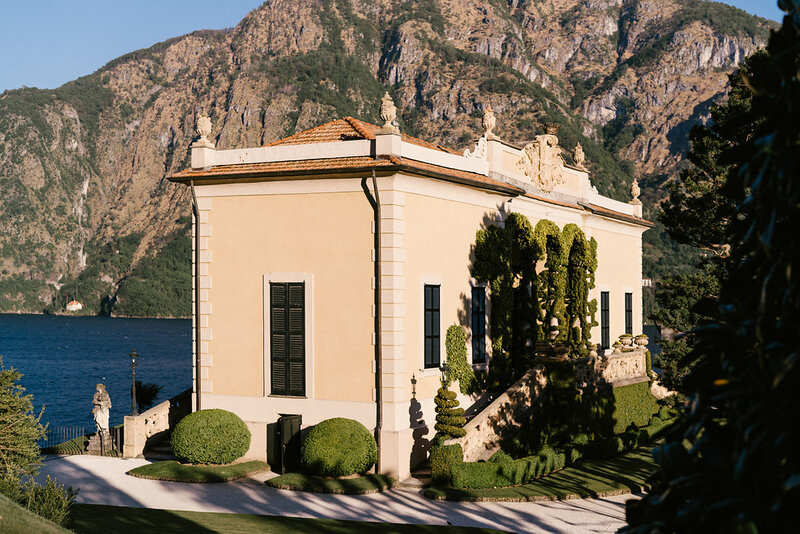 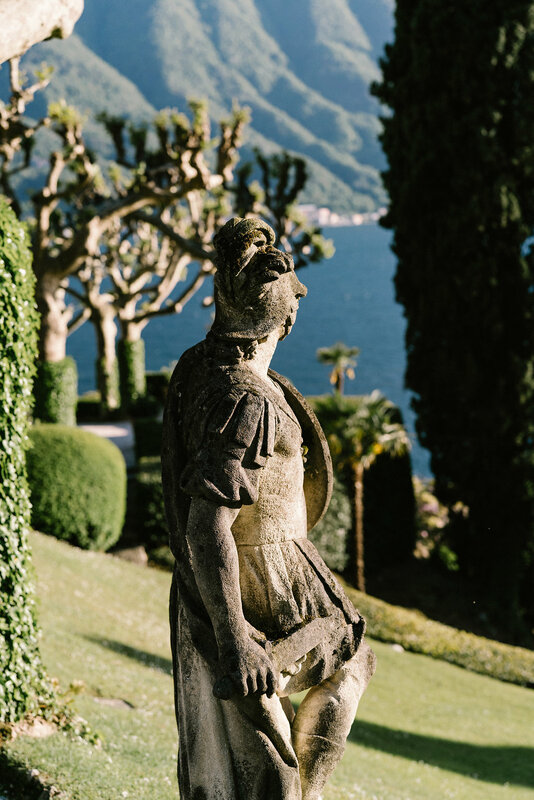 Villa del Balbianello is an extremely sought after wedding and film location. 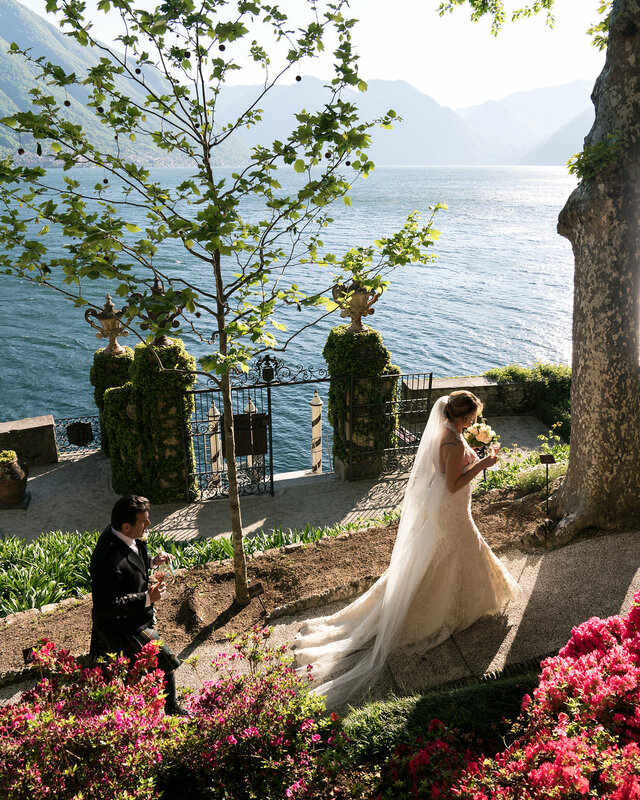 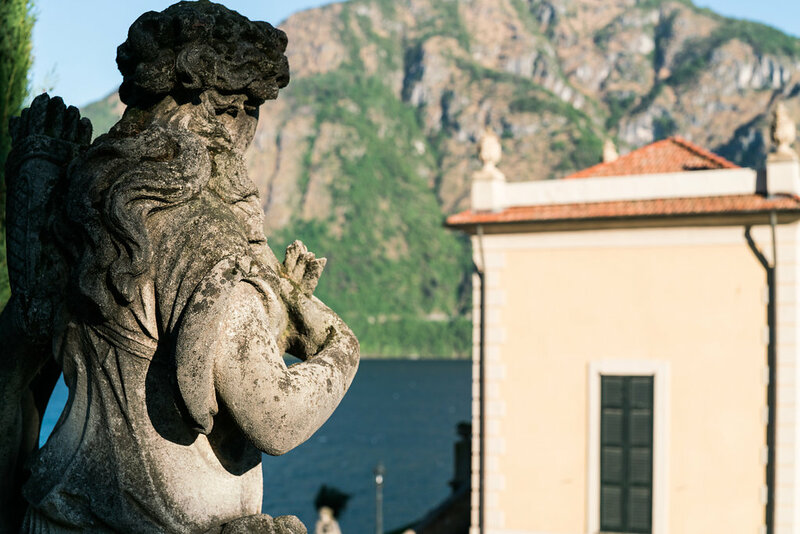 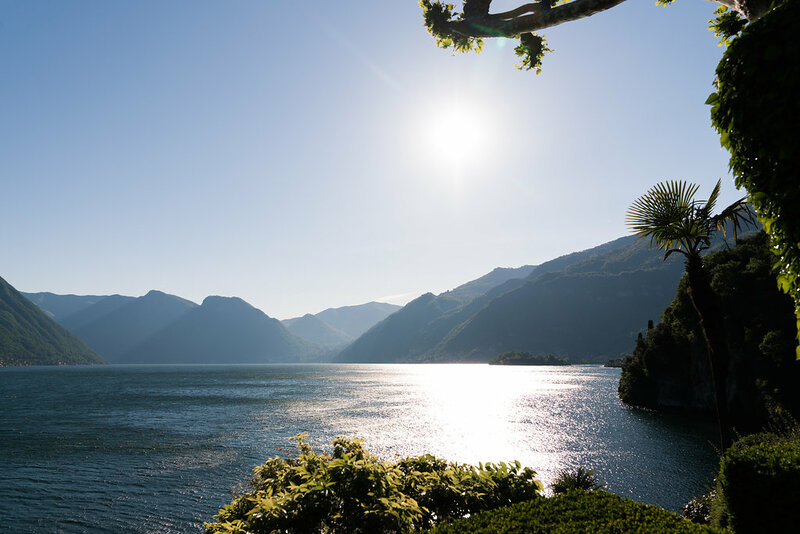 Lake Como’s dramatic natural beauty has enticed film makers and couples in love for many years. 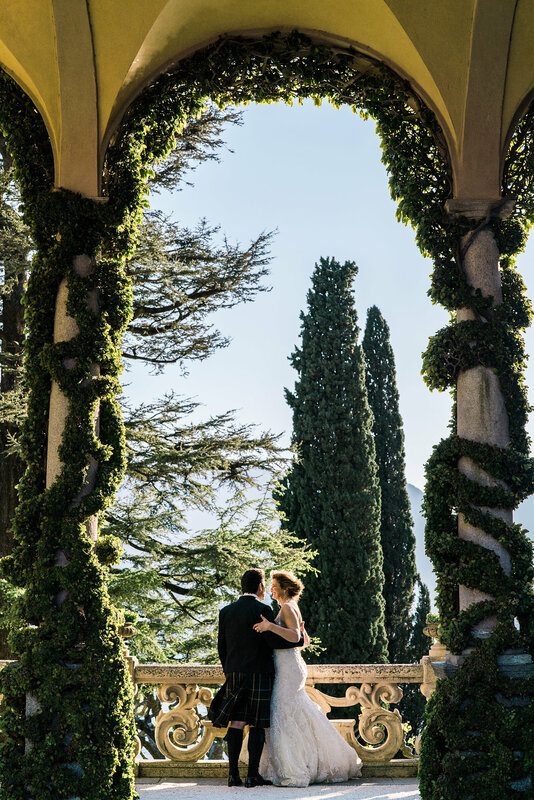 The irresistible combination of majestic mountain ranges, crystal clear waters and lush greenery provide a captivating cinematic and wedding feast for the eyes. 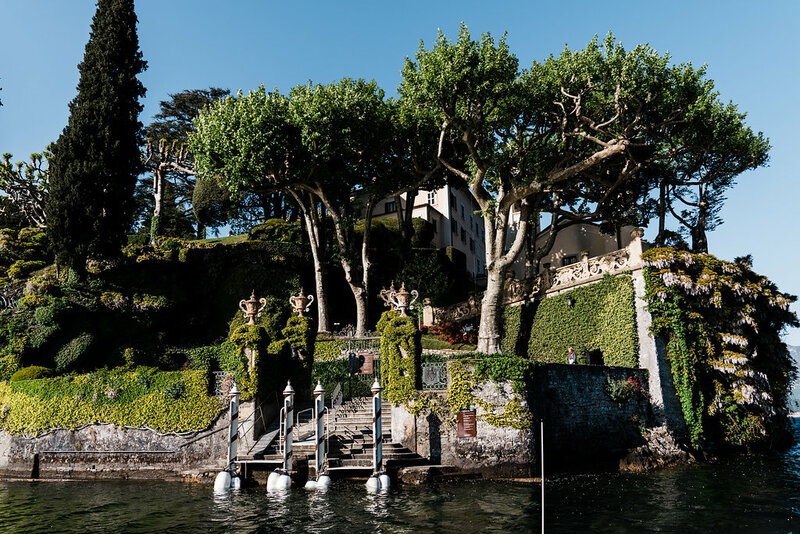 Hollywood actors of box office famed classics shot here include; Daniel Craig in his lauded Bond debut of Casino Royale and subsequent hit Quantum of Solace, Natalie Portman in Star Wars: Episode II Attack of The Clones and Uma Thurman and Vanessa Redgrave, who starred together in the delightful romantic comedy A Month By The Lake, recounting fictional mismatched romantic leanings during 1937 in the enchanted month of April. 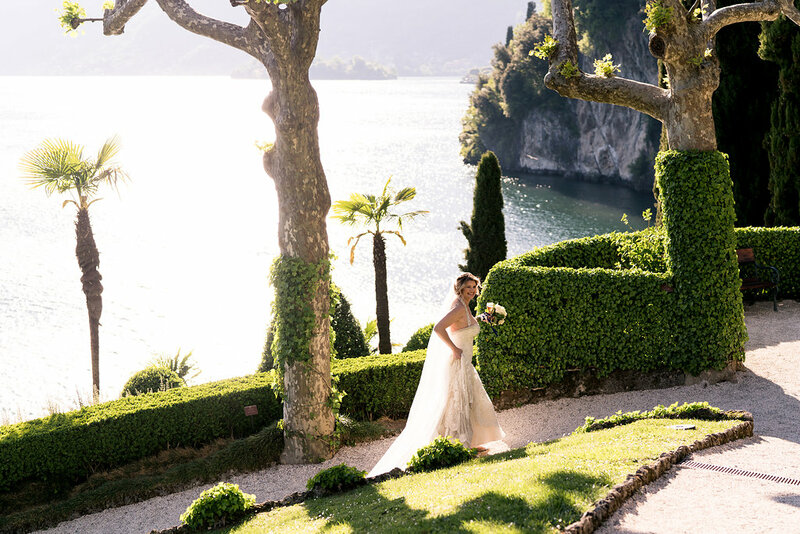 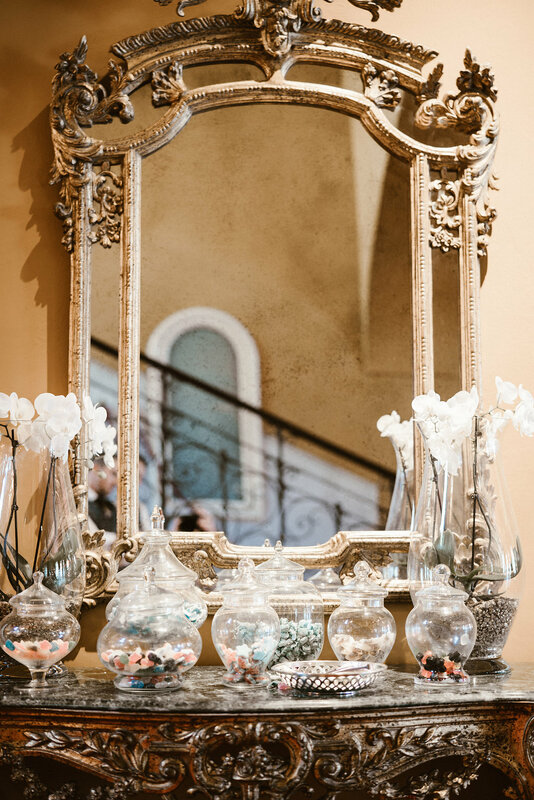 The Villa’s filmic fame is the proverbial icing on the wedding cake and a favourite choice for engaged couples the world over, seduced at first sight by such breathtaking views and timeless glamour. 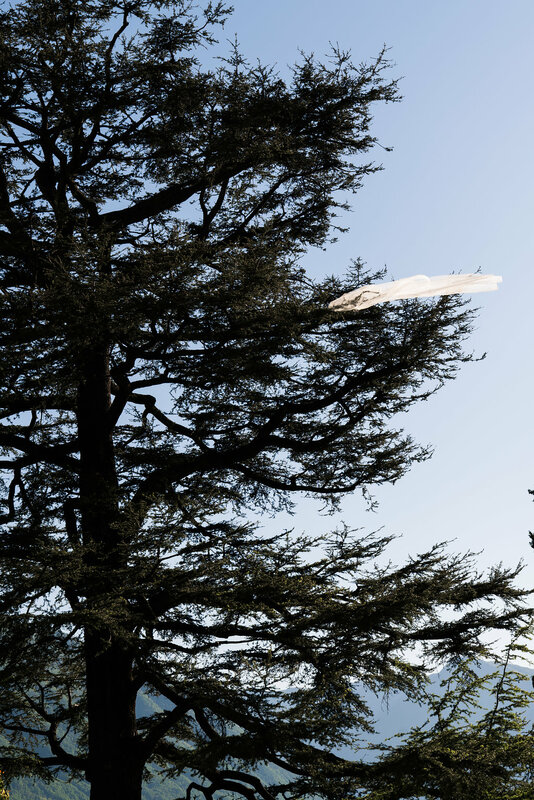 It was a sun kissed if rather blustery wedding day and to the couple’s great amusement the Bride’s veil took flight at the beginning of the ceremony but thankfully soon recaptured by a vigilant member of staff from one of the highest boughs of a nearby tree! 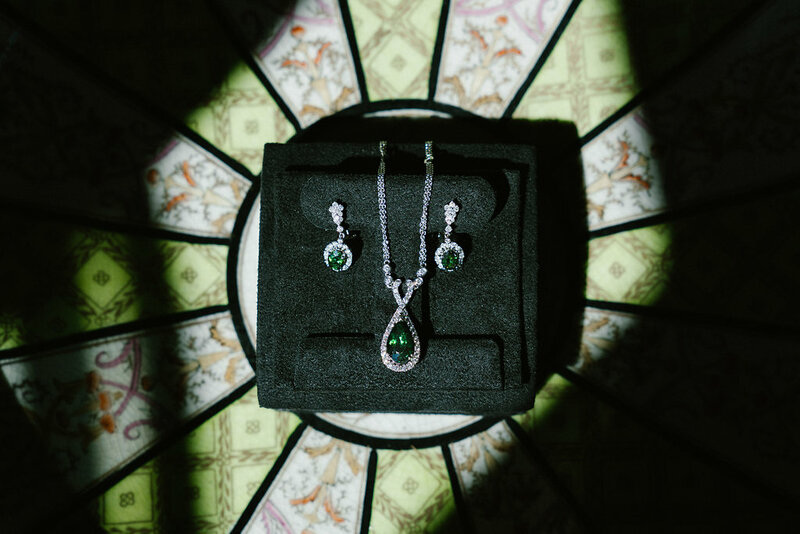 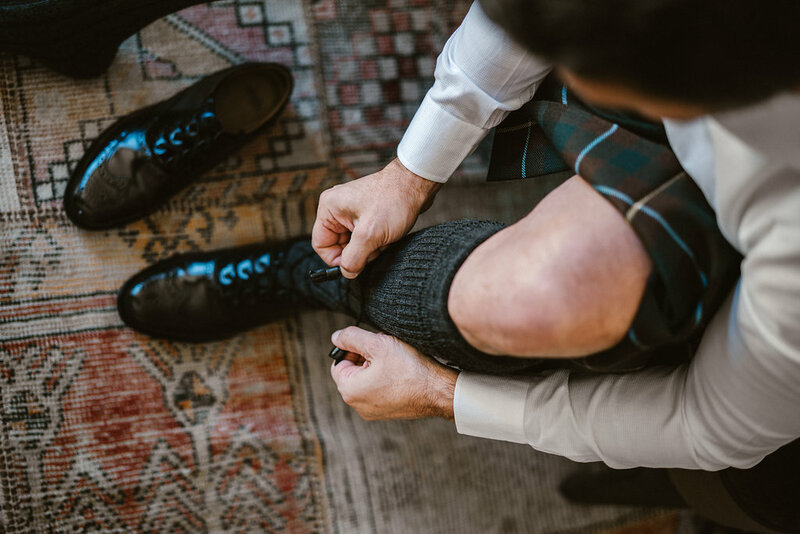 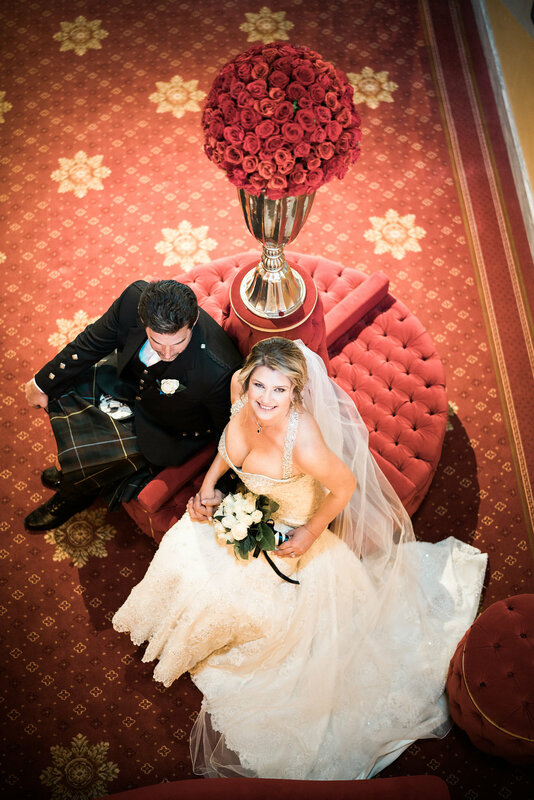 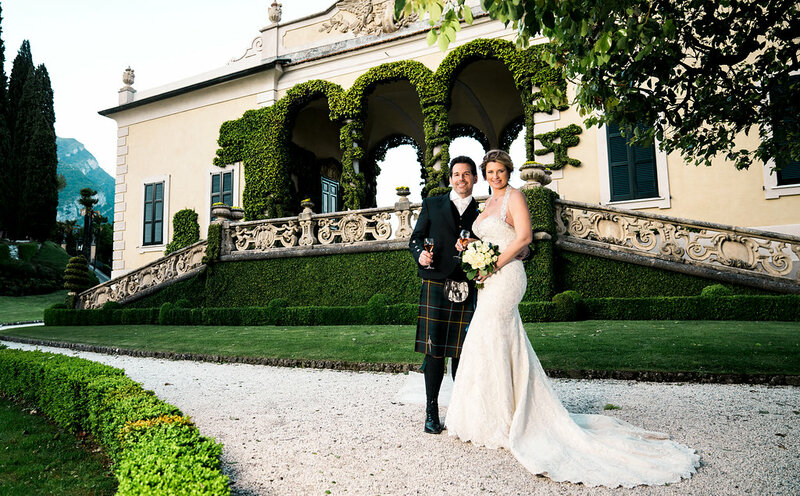 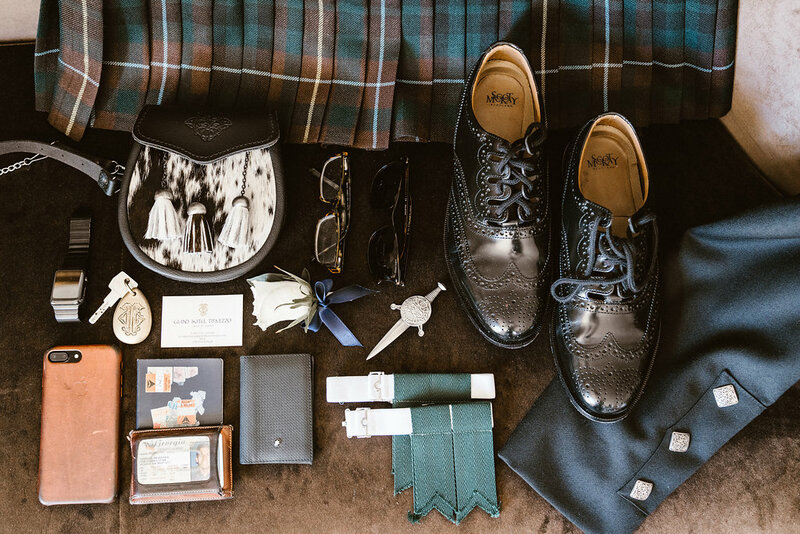 Steve cut a dashing figure in traditional Scottish attire and Tammy’s gorgeous halter-neck Bridal gown was complemented by custom made diamond and emerald jewellery. 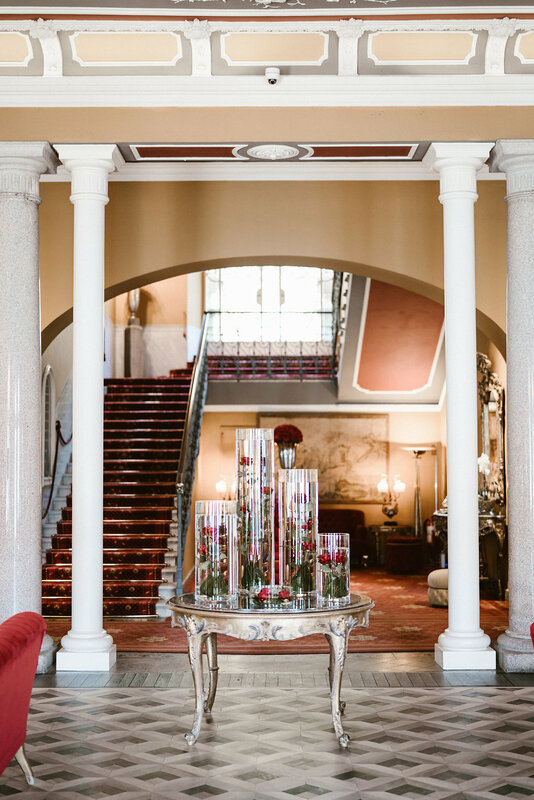 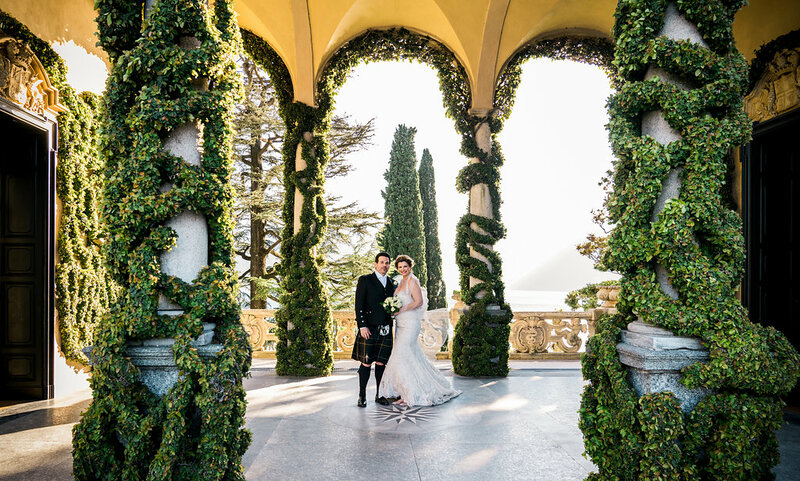 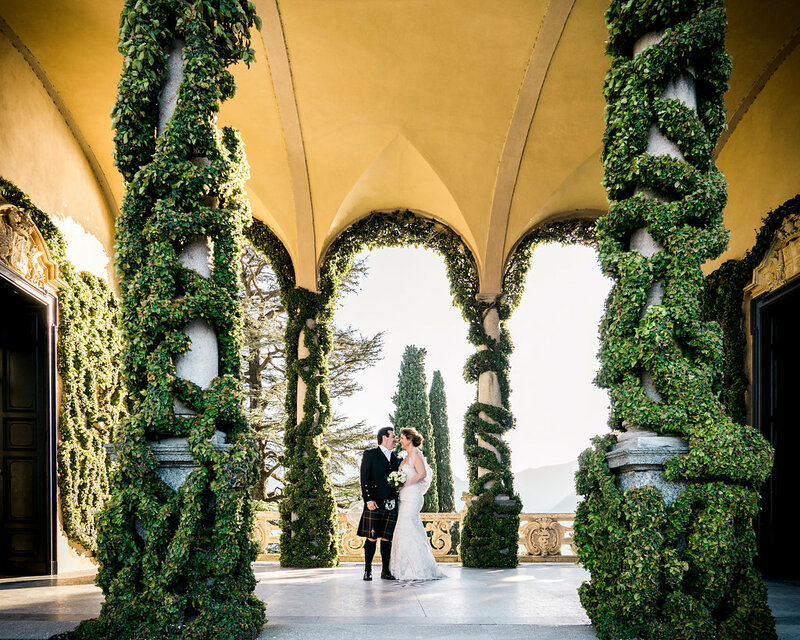 The couple’s civil ceremony was conducted in conjunction with a personalised Blessing of a romantic and spiritual nature under the protection of the ivy pillared loggia. 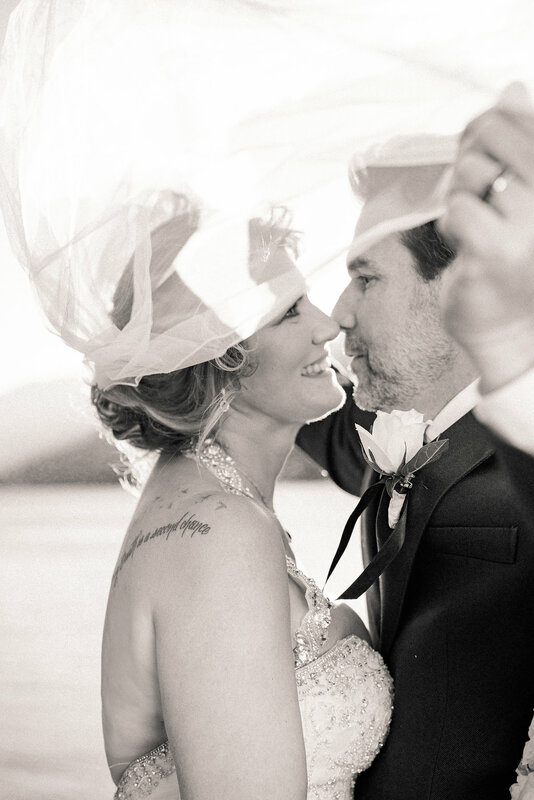 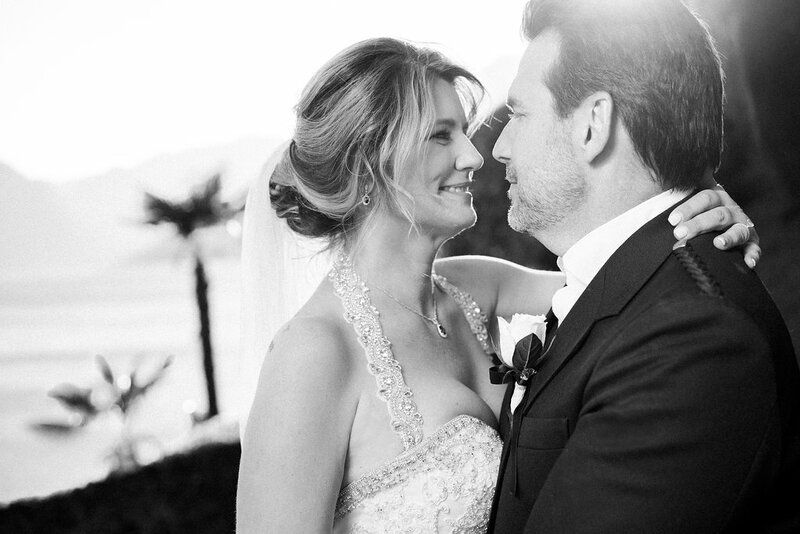 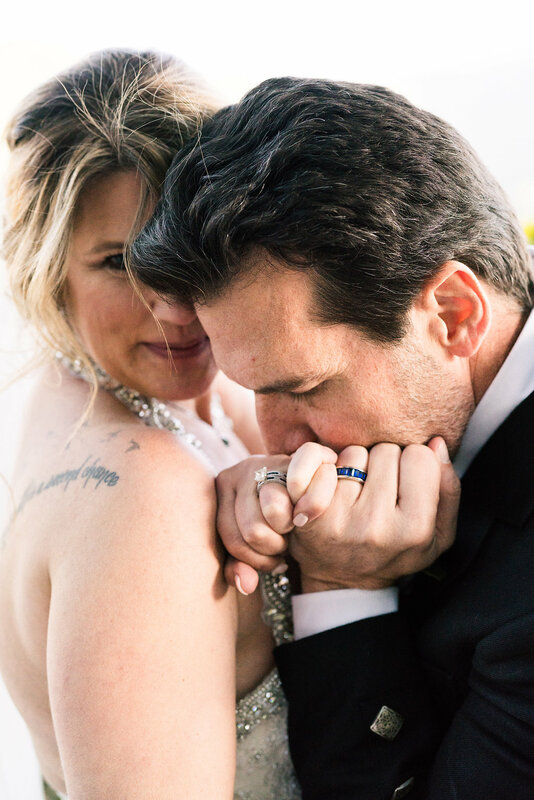 Clearly very much in love, Tammy and Steve approached their ceremony in the best spirit possible. 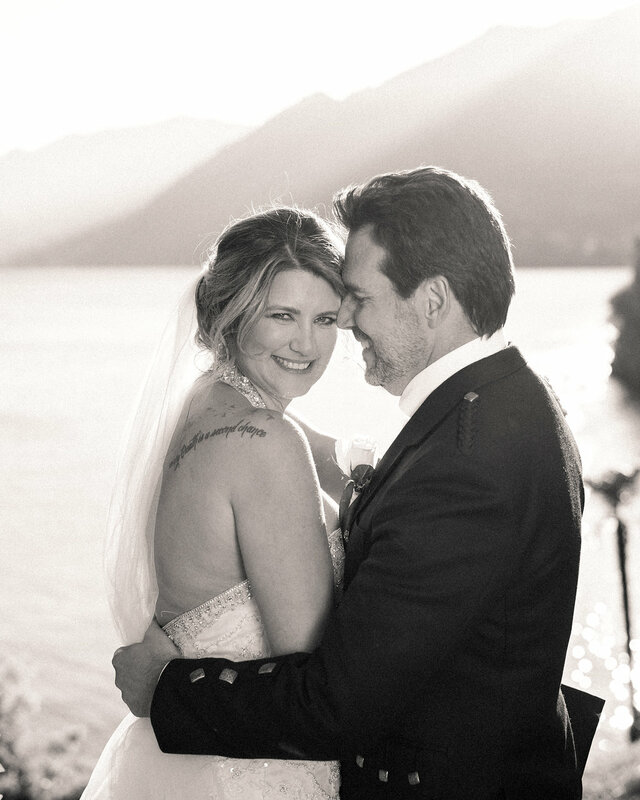 They were open to ideas, spontaneous, relaxed and savoured every moment. 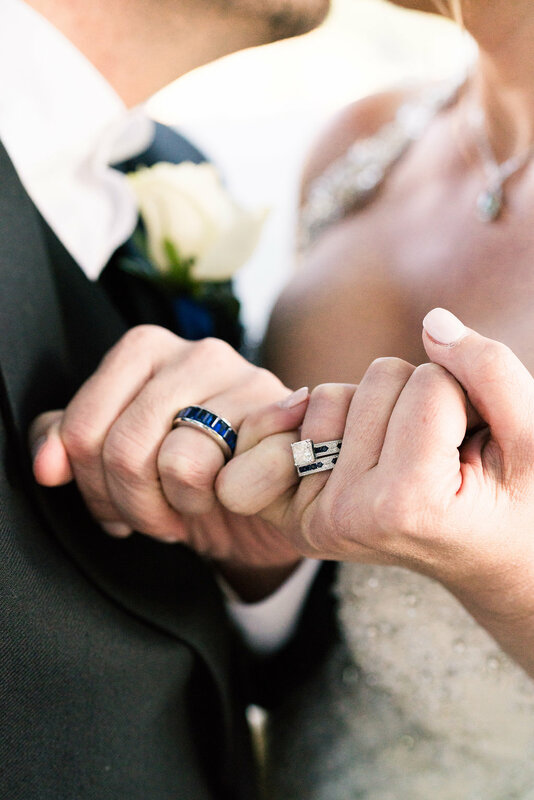 Their positivity and implicit trust in our service made the experience truly unforgettable. 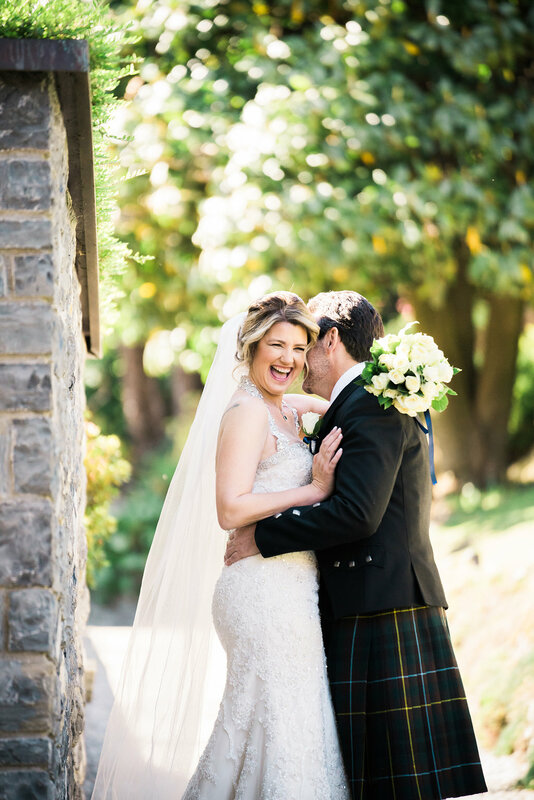 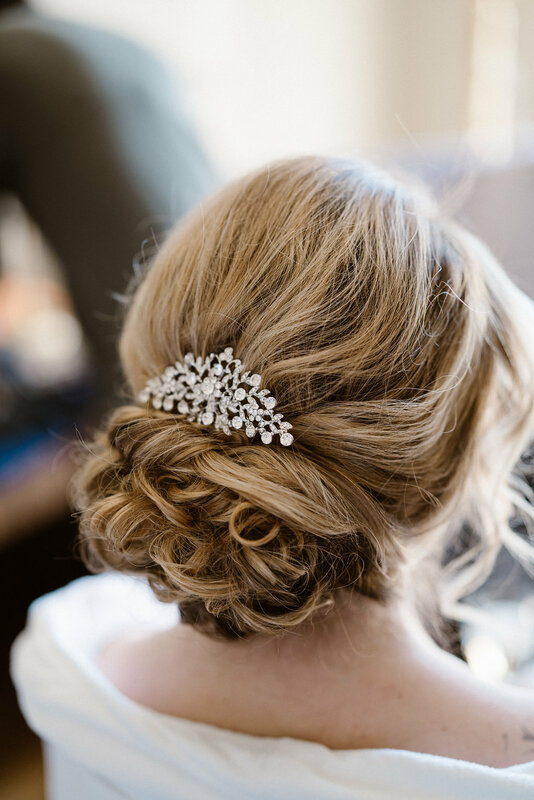 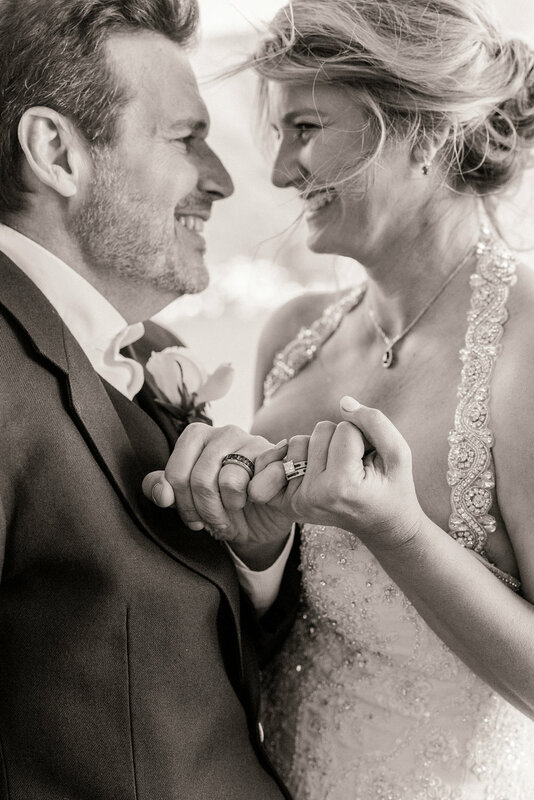 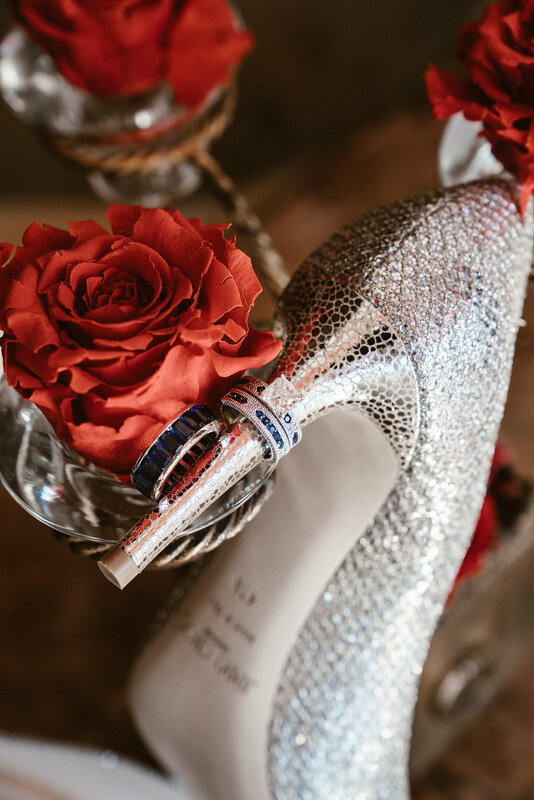 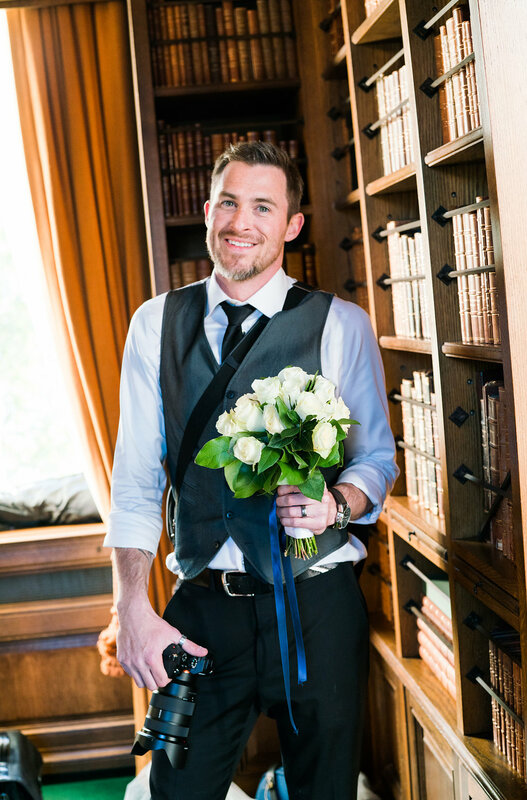 It was also the first time we had the pleasure of meeting professional photographers Katie and Kevin Hulett who are the dynamic and talented team known as Khulett Photography http://khpstudio.com. 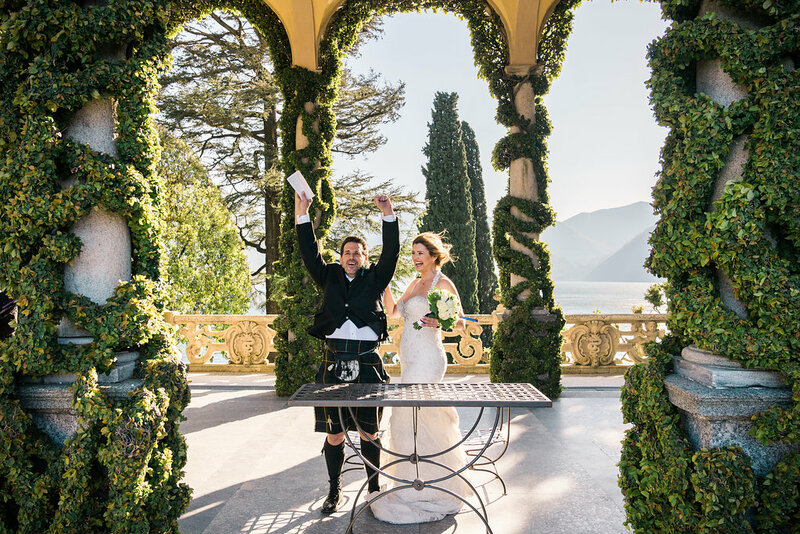 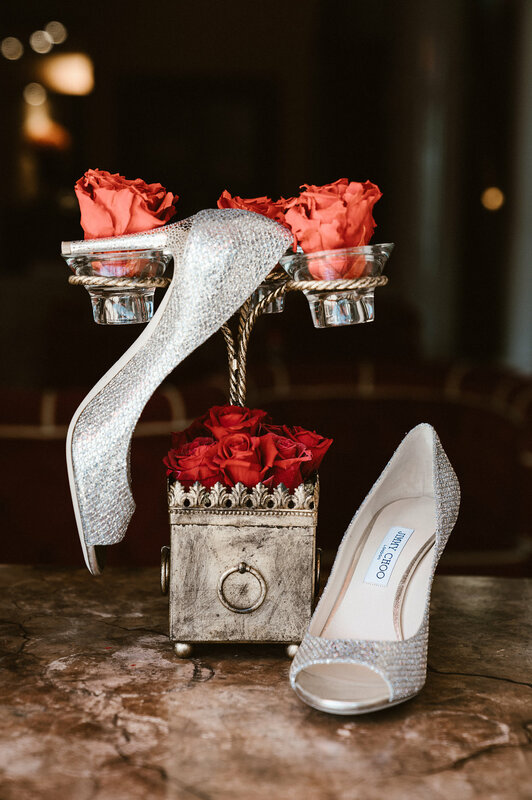 We would like to thank them for sharing these fabulous images with us and of course to express our immense gratitude to the amazing Tammy and Steve for allowing us to showcase their fun and romantic destination elopement.. framed in the famous Villa del Balbianello, a most precious gem of the Italian north.